Ratio is an important aspect of the St. John's UMC Preschool culture. The child to staff ratio at St. John's UMC Preschool Plus meets and exceeds the state minimum standards in every class. The number of children that can be accommodated in each Preschool classroom is based upon room measurements. Teachers of our youngest children encourage them to develop a love of learning through their enjoyment of the preschool and its activities. Our students learn to put squares and circles into puzzles and to identify themselves in a mirror or picture. They enjoy moving and listening to music, using art materials, and engaging in play for extended periods of time. Vocabulary and literacy development through books and games is an important part of the day. 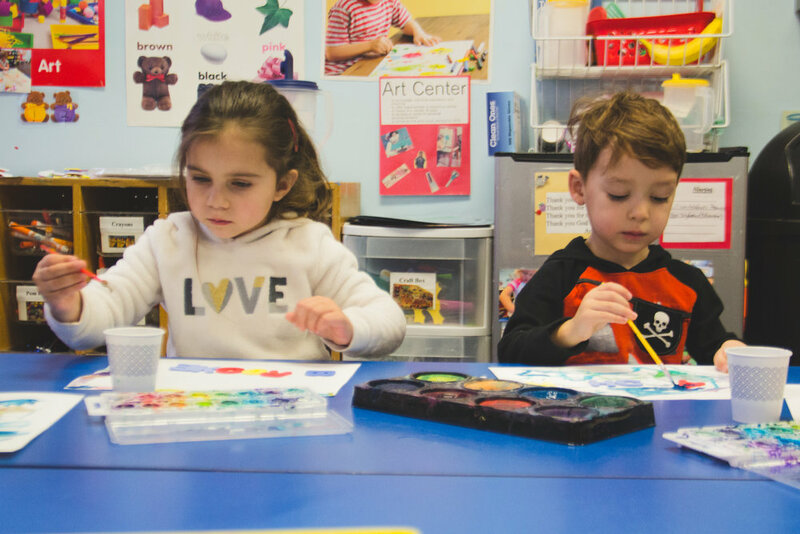 This age group is always exploring their surroundings, and the St. John's Preschool staff offers a variety of age-appropriate fun activities that promote learning at every turn. With the 4:1 child-staff ratio, our toddler friends receive the support they need to learn to trust adults who are not members of their immediate families. They transition to a two-year-old class with ease. These active children continue to develop as individuals. Students learn manner words such as "thank you" and "please." The children move from parallel play to interactive play as they mature. They demonstrate age-level, self-help skills, such as going to the toilet and washing their hands carefully before eating their nutritious snacks. They develop an understanding of what it means to share, to take turns, and to be a kind friend. As attention spans increase, the students will be able to attend to a story or a class activity for longer periods of time. Vocabulary expands to include comparative and descriptive words, and art activities promote creativity. The children will be ready to enter a three-year-old class with assurance and excitement. Enriched classroom activities encourage these children to continue to exhibit their love of learning. Literacy development includes songs, letters, and books to share. Numeracy skills include shape and numeral recognition, as well as comparative language and counting. Scissors are added to the art materials so that simple cutting will take place. The children display social skills that they will use for the rest of their lives, such as taking turns, working together, and being a good friend. Our students are always eager and prepared to enter into a pre-k classroom. A rich pre-kindergarten curriculum is available for the children in this class. Students continue to develop literacy and numeracy skills, and they enjoy enhanced music and art activities. They exhibit confidence in acquiring new skills and in their ability to make wise choices. 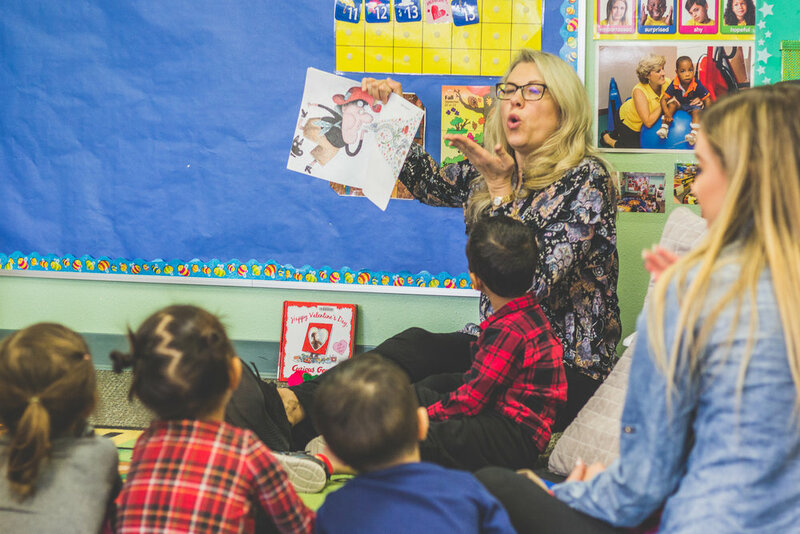 As students become more independent, they also display a greater level of social interaction with their friends and with the adults at the preschool. Our students are prepared to enter a kindergarten setting with confidence. Preschool Plus offers music class each week. The children are introduced to basic music concepts, such as rote singing, echo improvisation, tempo, steady beat, music-directed motion, expression through music, and dramatic play. They use Orff instruments, which are designed to support the participatory Orff approach to music education. Students enjoy the opportunity to sing and dance for their families twice a year during Christmas and spring family programs. As an alternative to going on off-site field trips, St. John's Preschool offers a monthly center-wide activity that takes place on-site. For example, because February is dental awareness month, we invite a dentist to visit the school each year. Our dental expert demonstrates the proper way to care for teeth and emphasizes the importance of eating healthy foods. *The Preschool Plus Extended Care program has low student to teacher ratios, so space is limited for enrollment. ** Must celebrate first birthday before September 1st.